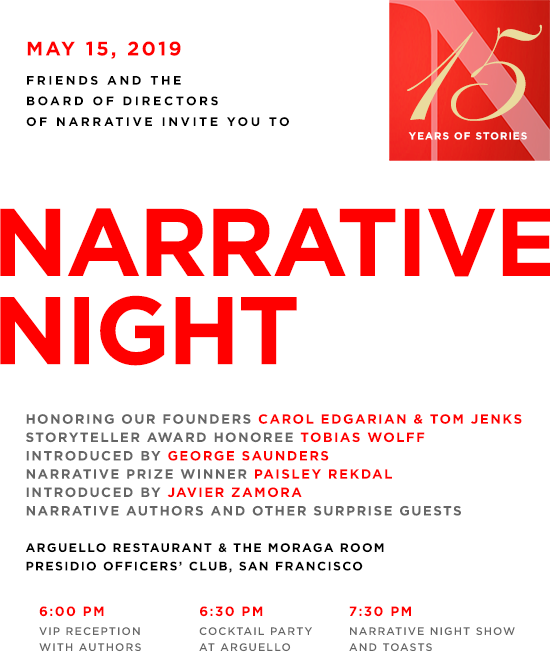 This is our primary fundraiser, and Narrative Night sells out early. Don't miss out! Reserve your seats today. Carol Edgarian is cofounder and editor of Narrative. Her novels include the New York Times–bestselling Three Stages of Amazement and the international bestseller Rise the Euphrates. Her essays, articles, and interviews have appeared in the Wall Street Journal, W, NPR, and elsewhere. Edgarian is coeditor (with Tom Jenks) of a popular collection drawn from great writers’ diaries, The Writer’s Life: Intimate Thoughts on Work, Love, Inspiration, and Fame from the Diaries of the World’s Great Writers. Tom Jenks is cofounder and editor of Narrative. He is a former fiction editor of Esquire, literary editor of Gentlemen’s Quarterly, and senior editor at Scribner, where he edited to great acclaim Hemingway’s posthumously published novel The Garden of Eden. With Raymond Carver, Jenks edited American Short Story Masterpieces, an anthology widely used in college and university classes for the past thirty years. He is the author of A Poetics of Fiction: Six Chapters on the Art of Imaginative Prose. His work has appeared in Harper’s, Ploughshares, Vanity Fair, Esquire, The American Scholar, and elsewhere. Tobias Wolff, this year’s Narrative Storyteller Award honoree, was awarded a National Medal of Arts for his contributions as an author and educator and is the author of two celebrated memoirs, This Boy’s Life and In Pharaoh’s Army. His novella The Barracks Thief received the PEN/Faulkner Award for Fiction in 1985. Wolff has written two novels and several story collections considered contemporary classics, including Our Story Begins: New and Selected Stories. George Saunders is the author of four short fiction collections, an essay collection, two novellas, and a novel. He received an MFA from Syracuse University, where he has taught writing since 1996. Saunders has received numerous awards, including the PEN/Malamud Award, a MacArthur Fellowship, a Guggenheim Fellowship, and four National Magazine Awards for Fiction. His novel Lincoln in the Bardo won the 2017 Man Booker Prize. He was elected to the Academy of Arts and Sciences in 2018. Paisley Rekdal, winner of the 2018 Narrative Prize, is the author of the essay collection The Night My Mother Met Bruce Lee; a memoir, Intimate, combining poetry, fiction, nonfiction, and photography; and several poetry collections, including Animal Eye, winner of the 2013 UNT Rilke Prize, Imaginary Vessels, and Nightingale (Copper Canyon Press, 2019). The recipient of two Pushcart Prizes, Rekdal teaches at the University of Utah, where she is also the creator and editor of an archive project entitled Mapping Salt Lake City. Javier Zamora, winner of the 2017 Narrative Prize, was born in El Salvador and immigrated to the United States when he was nine. He received an MFA from New York University and won a 2016 Ruth Lilly/Dorothy Sargent Rosenberg Fellowship and the 2016 Barnes & Noble Writer for Writer’s Award. Zamora’s first poetry collection is Unaccompanied (Copper Canyon Press, 2017), and he is a 2018-2019 Radcliffe Fellow at Harvard University. Narrative is the leading digital publisher of fiction, poetry, essays and art. Each year we publish hundreds of artists, including emerging authors and winners of the Nobel Prize, Pulitzer Prize, and National Book Award. Every dollar donated to Narrative supports our library of great literature that’s available to readers for free. Our Narrative in the Schools program provides vital support to teachers and students in underserved communities throughout the world who seek engagement in the literary arts but are too often hampered by limited resources. Narrative in the Schools offers lesson plans, video writing tutorials, the Narrative “Tell Me a Story” High School Writing Contest, and, of course, our free, ever-expanding library of literature, with thousands of stories, poems, essays and art used in classrooms around the globe—to teach, inspire, engage and connect the generations. After all, as we often say, we know ourselves and our world by the stories we tell. We strive to bring you, our readers, the best stories and poems of the day, and of all days.